Everything else is just a Dog! Our music tells a story! This website is designed by and is the property of NormaDsign, ©2006, all rights reserved and is not to be copied in any way whatsoever without express written permission! Graphics by Laurie Mann, ©2006, all rights reserved Copyright ownership of photos indicated by mouseover. 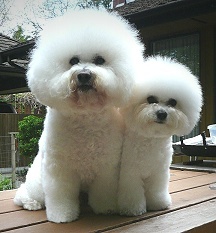 Bichon gif images ©Estate of Kiyomi Ochiai or were created specifically for NormaDsign None of the foregoing are to be copied from this website without written permission. This applies to all pages of this website (external links excepted). Music used on this website is given credit where appropriate. A special thank you to everyone taking part in this project.